Well it’s Thanksgiving today in Canada and even though many people think that us frenchies (I’m from Montreal which makes me French Canadian) don’t celebrate this wonderful and delicious holiday, well we do! And to prove it here is a great recipe that I found last week on the Martha Stewart website and it has been tried, tested and approved ny none other than MOI! Oh yes, by my friends and family too of course! This cake reminded me of the pumpkin pie my mother use to make when I was little. 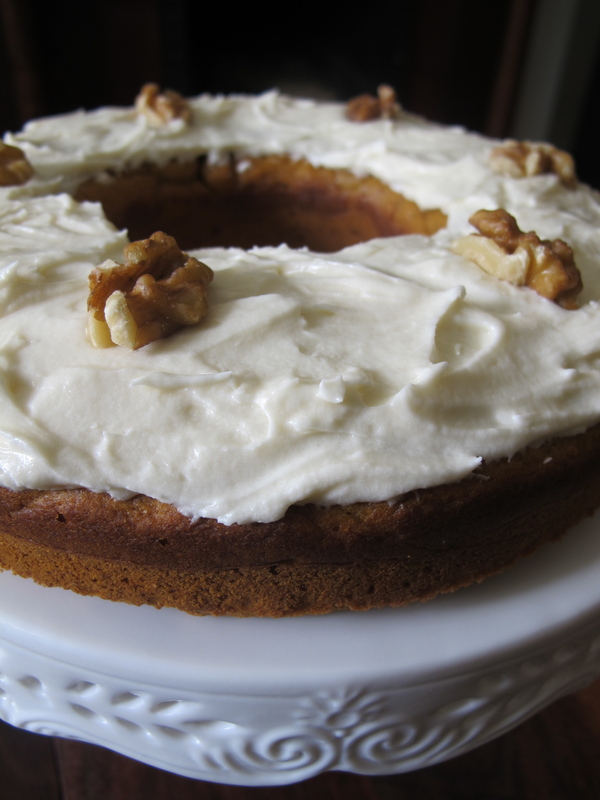 Oddly, I don’t really like pumpking pie so why I was so attracted by this cake recipe is a mystery to me. I guess that I was in the Thanksgiving spirit? 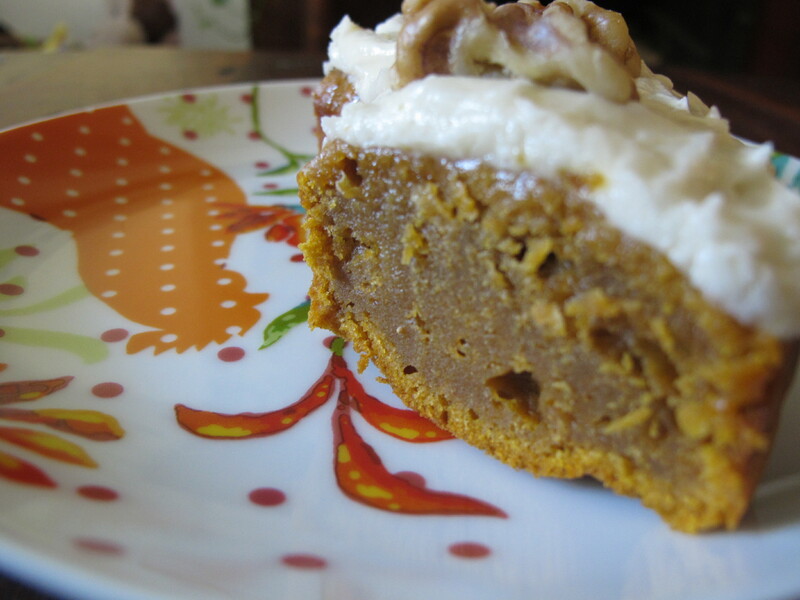 The cake is very dense and doesn’t really taste like pumpkin at all. Even my friend who hates the vegetable in the cake combo, went for a second piece. Martha suggested a vanilla frosting. It was okay but a bit sweet, if I were to do it again I think that I would try some type of glaze (orange perhaps?) instead. But the icing made it rustic looking which was nice. I didn’t put any nutmeg or allspice as I don’t like those spices very much.And I reduced the amount of sugar as well (which was a good thing because the icing is very sweet). If you want to make the cake look more festive you could always add some orange food coloring in it! Heat the oven to 350 degrees. Butter a 9-by-2-inch round cake pan. Coat with butter. In a large bowl, sift together flour, cinnamon, salt, baking powder, and baking soda; set aside. Pour batter into prepared pan, and bake until a cake tester inserted into the middle comes out clean, about 50-55 minutes. Transfer the cake to a wire rack to cool. Let cake rest 20 minutes. 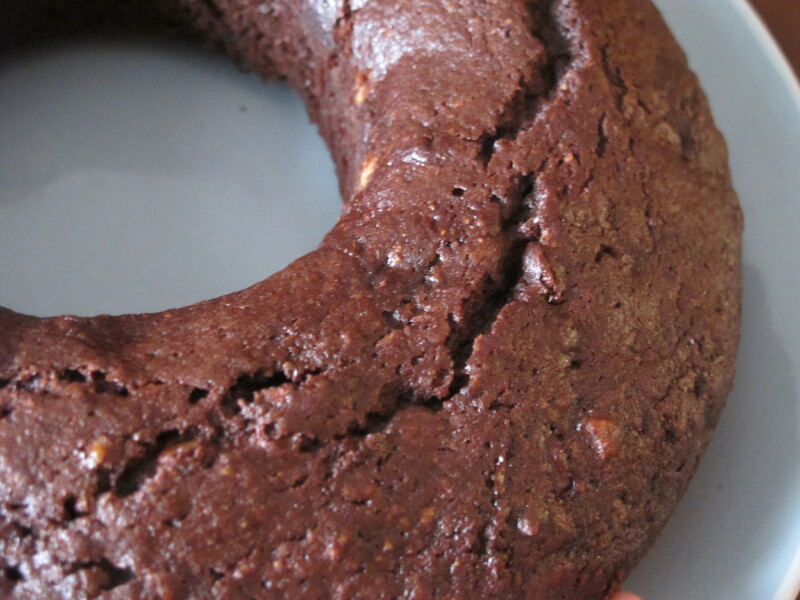 Unmold cake. 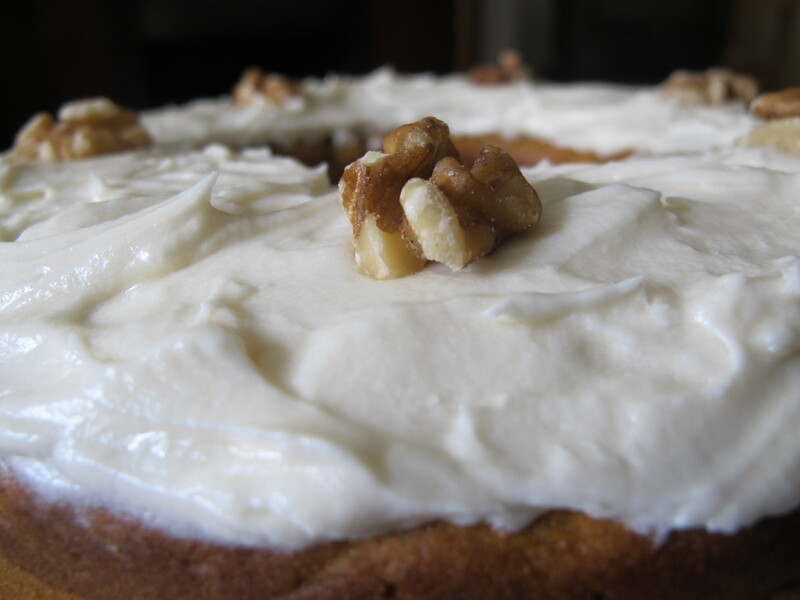 Using an offset spatula, spread icing over top of cake, and decorate with walnut halves. In a bowl, mix butter, sugar, vanilla, and milk; stir until smooth. Layer over cake once the cake has cooled. 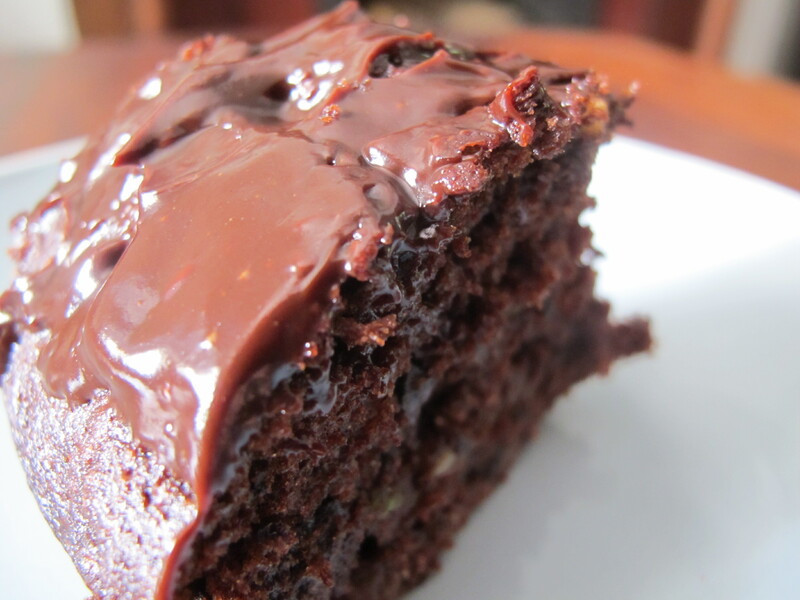 The moistest chocolate & zucchini cake ever! Well the cold weather has finally come to Montreal, and when it’s 10 degrees outside, all I want to do is put on my pj’s and some warm wool socks and bake something that will warm me up. I found this great recipe a few weeks back and I’ve done it twice already! The cake usually lasts less than 2 days in my house which is a good indication that it’s FANTASTIC! I must say that it’s probably one of the moistest cakes that I’ve ever made and with the chocolate icing to top it off it’s simply delish! 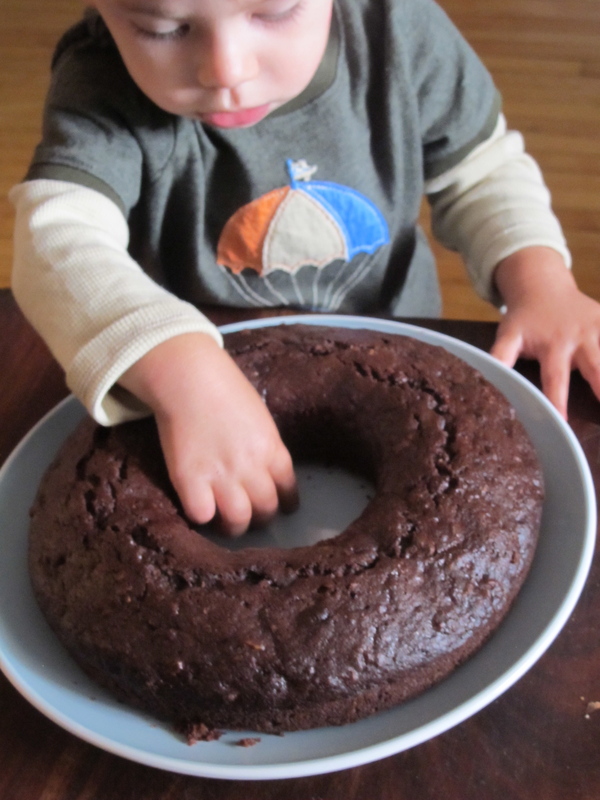 Even baby couldn’t resist this tasty cake! In a pan melt the butter. Add the chocolate chips and some cream until the desired texture is reached. Heat your oven at 350 degrees. In a mixer, combine your oil, sugar and vanilla. Add in your eggs and shredded zucchini. In a separate bowl, mix together your flour, cocoa powder, baking soda and baking powder. Slowly add this dry mixture into your wet mixture. Beat until combined. Mix in your chocolate chips.